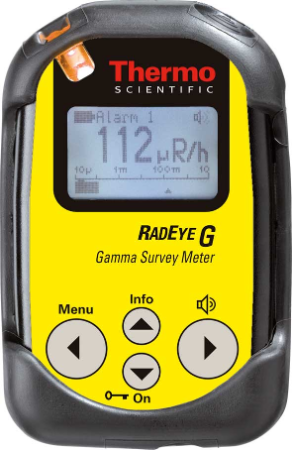 RadEye G /G-10 instruments are used for gamma surveys from background up to personal safety levels. Applications: High sensitivity to low energy gamma radiation in harsh environments. Audible single pulse indication and finder mode. Incorporates a large energy-compensated Geiger-Mueller tube for the precise dose rate measurement of gamma and X-ray radiation. Intelligent ratemeter algorithm (ADF mode) ensures that even the smallest changes in dose rate are immediately detected, while, at the same time, random fluctuations are effectively suppressed. Removable rubber sleeve for extra protection. All essential functions are easily accessed by users wearing protective gloves. Alarm LED can be seen while instrument is housed in belt holster; also features built-in vibrating alarm. Large graphic display with clear prefix and bar graph.